One of the most important decisions you will make concerning you food plots is deciding what to plant. During recent history the bulk of deer food plots were monocultures meaning one species of plant such as clover. These planting were often of low quality forage, and that is still the case with many land owners and managers today. But times are changing. Knowledge and planting techniques are getting more extensive and better every year. No longer or hunting clubs restricted to planting forage that was designed for livestock. No longer are hunters settling on low quality forages, and just as importantly, no longer are food plots restricted to those with access to expensive farm machinery. deer in food plotThis brief food plot article will hopefully enlighten you to a few kernels of knowledge that will allow you to understand the advantages that can be achieved by using mixed forage food plots. Mixed species plantings can be defined as a single food plot containing two or more forage species. Why is this such a GREAT improvement. The answer to that question lies in the life cycle of any plant. Forage crops go through various stages in their life cycle. The first stage for this discussion will be the germination and early growth stages. Second is maturing but still fast growth stage, and finally the third stage is the stage of decline. Decline in growth and decline in palatability. Each of these stages is somewhat different with each plant. Some plants are very vulnerable to over grazing when they are in the first stage. Others forages are not even desirable to deer until they mature. Also key to the advantage of mixed forage plantings is when does each plant reach each of the three stages of development. Because each plant is different this gives the land manager/hunter the chance to mix and match different seed combinations so that the various species of plants can grow together providing a more durable and longer lasting food plot than could be achieved with any single species alone. 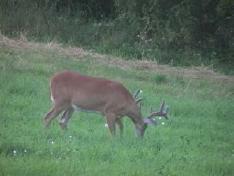 big buck Plants are most palatable and subsequently most nutritious when they are actively growing. However, as a plant advance through their life cycle fiber content increases and protein levels decrease. By planting different forage species with staggered maturity dates the length of time that very palatable forage is available will be increased. A side benefit is that mixed planting will also reduce the risk of total crop failure due a multitude of factors such as insects, disease, or poor weather conditions. An example of a cool season combination that does well in the south is a mixture of oats, wheat, crimson clover, and arrowleaf clover. I believe this combination was first discovered by the MDWF. The Oats and wheat will germinate and grow quickly insuring quality forage in the fall. The crimson clover seed will germinate but is slower to mature. Growth will be slow until late winter, when crimson clover will more rapid growth through the spring. The Arrowleaf will not mature until mid-June until the first of July. Therefore, this mixture can supply quality forage on the same food plot for nearly nine months and will almost always have one plant in its highly palatable stage of development. And example of a simple mixed forage crop is a food plot of wheat, oats, and clover. The plants mature at slightly different times thereby providing a succulent actively growing food plots all through the winter. Another example is mixing ironclay cowpeas with another forage such as Alycen clover (not really a clover) or Joint vetch. Ironclay peas are highly desirable to deer and once a food plot matures the deer can literally wipe it out in a matter of days. By mixing the peas with vetch or some other forage the food plot can remain productive for a much longer period of time. And there in lies the brilliance behind mixed forage food plots. You are able to have a more dependable food plot while at the same time maximizing its productiveness by having an extended stage 2 time period (in this case 9 months) than could ever be achieved with a single species monoculture. Deer seek out plants that are highly palatable. And isn't that the goal to keep the deer in your food plots more!!! Either for hunting opportunities or for maximizing antler and body growth.